A work of art contains intellectual insights, of course. But the power of a work of art, and the reason people still love it centuries after it has come into existence, is in its emotional insight. Take a look at the back legs of that horse and how it’s rearing. If that horse takes one step back, it’s going to fall off that ledge, and the whole campaign is going to be over. 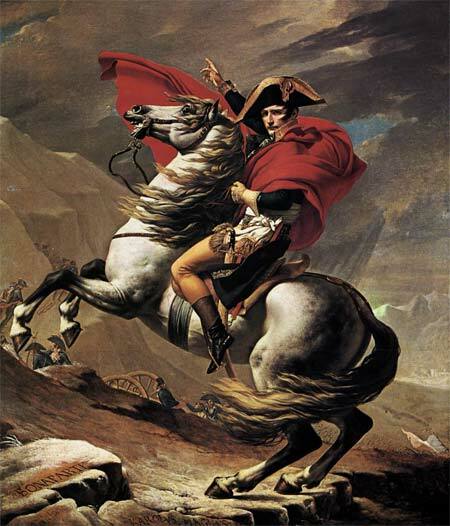 So you can restate this intellectual content of the painting as, “If Napoleon relaxes his vigilance for one second, the campaign will fail,” and, “It’s only Napoleon’s use of extraordinary ability that keeps all these men moving forward.” As intellectual insights, however accurate, these statements are all but truisms – not particularly remarkable. But with your emotional ability, you can appreciate the emotional insight communicated by this painting. You can feel it; the reason you can’t restate it in intellectual terms is that it’s emotional, rather than an intellectual insight. It’s all about the meaning of David’s emotions about Napoleon’s perseverance, dedication, and inspiration; and this can only be appreciated by the use of your emotional ability, rather than by the use of intellectual ability alone.